1317c, Used Rims, 15X7, 5 LUG, 4-3/4", 83-94, CHEVY, GMC, BLAZER S10, JIMMY S15,RALLY STYLE, BLACK, STEEL. 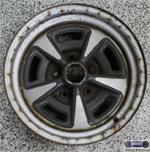 1325a, Used Rim,14X5-1/2, 5 LUG, 115mm, 83-91, OLDS, CUTLASS, CIERA, CRUISER. PAINTED TEAL, RALLY STYLE, STEEL. 1447a, CENTER CAP USED, 85-95, CHEVY, ASTRO. BLACK PLASTIC, 5 LUG NUT HOLES, POLISHED CENTER, BLACK BOWTIE, 7" DIA. 1447a, CENTER CAP USED, 85-95, CHEVY, ASTRO. BLACK PLASTIC WITH 5 LUG NUT HOLES AND POLISHED CENTER & BLACK BOWTIE IN CENTER. 7" DIA. FOR 15" STEEL RALLY RIM. 2012, Used Rims, 14X6, 5 LUG, 100mm, 91-94, DODGE, PLYMOUTH, CARAVAN, SHADOW, SUNDANCE, 5 SLOT, RALLY, STEEL. 2012, Used Rims, 14X6, 5 LUG, 100mm, 91-95, DODGE, PLYMOUTH, CARAVAN, SHADOW, SUNDANCE, 5 SLOT, RALLY, STEEL. 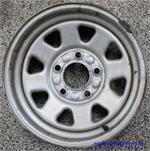 65751a, Used Rims, 16X6, 5 LUG, 4-1/2", 97-99, MITSUBISHI, ECLIPSE, SILVER, 5 SPOKE, ALLOY. 966a, Used Rims, 15X7, 5 LUG, 4-3/4", 73-87, PONT, FIREBIRD, GRAND PRIX, LEMANS, RALLY WHEEL11, GRAY 5 SLOT STEEL. AVAILABLE IN SEVERAL COLORS. 998, Used Rims, 15X8, 6 LUG, 5-1/2", 74-91, CHEV, GMC, BLAZER, JIMMY, TRUCK 1500. GRAY STEEL, RALLY. 998, Used Rims, 15X8, 6 LUG, 5-1/2", 74-91, CHEV, GMC, BLAZER, JIMMY, TRUCK 1500. GRAY STEEL RALLY.